OPPO has been at the forefront of technological innovation and design since the inception of the Find series in 2011. With the recent launch of their premium flagship smartphone, Find X, the globally recognized brand brings users a first of its kind handheld experience exploring the artistry of design and futuristic technology. As the original patent holder, OPPO’s Find X uses a groundbreaking sliding structure that completely disguises the cameras within the body of the smartphone. When not in use, the cameras are hidden, providing a sleek and uniform exterior, however, when activated, the camera slides open making for a real show stopping experience. The stealth 3D cameras not only include the 25-megapixel front camera and 16MP+20MP dual rear cameras, but also a 3D Structured light module. Just two months after the launch of Find X, competitors have taken note of OPPO’s technological advancements, with Huawei Honor Magic 2 and Xiaomi Mi Mix 3 stepping onto the scene with their own attempts of notch-less phones and sliding cameras. 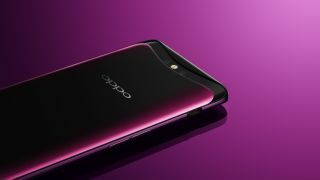 OPPO’s Find X is the world’s first smartphone to accomplish a hole-less front and rear design, known as a Panoramic Arc Screen. The moment the screen is lit, the phone reveals its no notch, no cut and an all screen display. The smartphone boasts a refined silhouette thanks to OPPO’s refusal to compromise and blend in with competitors by negating the need for a notch in Find X’s display. As one of the few brands to accomplish this, OPPO remains a forerunner in the tech industry – a brand concerned with design as much as they are hardware. Find X uses a Snapdragon 845 Mobile Platform with a Qualcomm Artificial Intelligence Engine. Furthering their commitment to exploring the artistry of design, OPPO’s use of a Multifaceted Color Process realizes a perfect blend of gradient design with a 3D arc on the rear. In the light, Find X shines with a gem-like effect that changes along with the surroundings. In Find X, the well-known VOOC flash charging sees a revolutionary upgrade with a Series Bi-cell batteries design able to support a 10V 5A fast charging mode. Charging power becomes doubled compared to a single cell and can reach full battery in 35 minutes. OPPO leaves nothing to chance with the additional safety features found compared to traditional VOOC’s. Find X’s flash charging option features five protections, including low temperature and low voltage to ensure a safe charge. OPPO has collaborated with Lamborghini for the Automobili Lamborghini Edition of Find X. The smartphone supports SuperVOOC Flash Charge technology while displaying a gradient carbon fiber texture. Reaching beyond the smartphone industry, OPPO is currently in the works with the automotive brand to explore the use of their VOOC technology in Automobili Lamborghini sports cars.